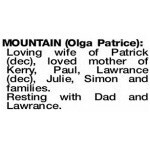 The Funeral Mass for Mrs Olga (Pat) Mountain, formerly of Bassendean will be celebrated in St Joseph's Church, 22 Hamilton Street, Bassendean commencing at 10:00 AM on FRIDAY (5.04.2019). A private Cremation will take place at a later time. 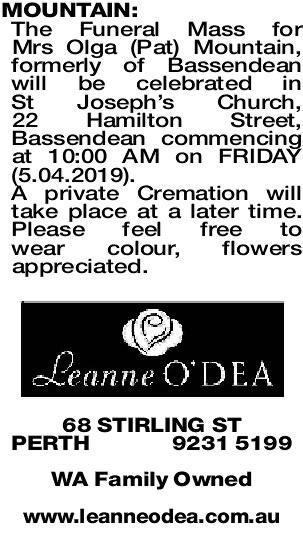 Please feel free to wear colour, flowers appreciated. 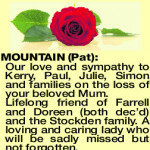 So very sorry to hear of Pat's loss. Our sympathy to family and friends. Our thoughts and prayers are with you all. The Holy Sacrifice of the Mass has been offered for the repose of Pat's soul. May she rest in Eternal Peace. 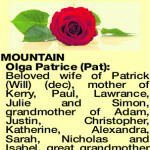 Loving wife of Patrick (dec), loved mother of Kerry, Paul, Lawrance (dec), Julie, Simon and families. Resting with Dad and Lawrance. 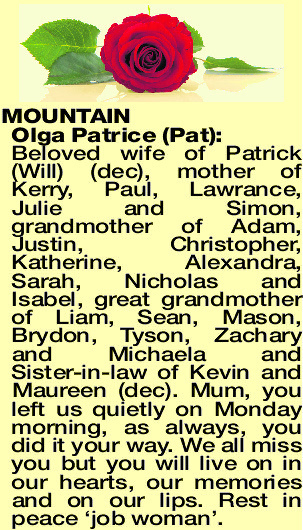 Beloved wife of Patrick (Will) (dec), mother of Kerry, Paul, Lawrance, Julie and Simon, grandmother of Adam, Justin, Christopher, Katherine, Alexandra, Sarah, Nicholas and Isabel, great grandmother of Liam, Sean, Mason, Brydon, Tyson, Zachary and Michaela and Sister-in-law of Kevin and Maureen (dec). 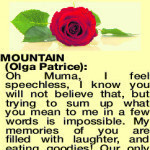 Mum, you left us quietly on Monday morning, as always, you did it your way. We all miss you but you will live on in our hearts, our memories and on our lips. Rest in peace ‘job woman'. Passed away peacefully very early on Monday morning, April 1st 2019, under the caring eye of her baby boy. Over the past many years we have loved you dearly and now our numerous tears will fill a bucket nearly. Now you have left us we love you still. Gone to Heaven to be with your beloved Will. This untimely departure will affect both young and old. 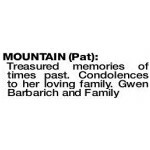 So farewell dear lady with your silver hair and heart of gold. May you rest in beloved and well earned peace. 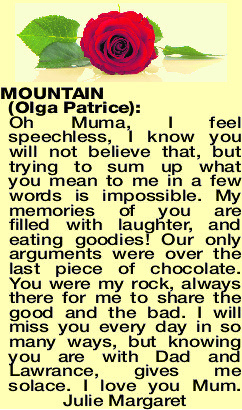 You will not be forgotten sweet Olga Patrice. Our sincerest condolences to your immediate and extended families at this extremely sorrowful time. From Inge, Joe, Maureen (dec) and Kevin. 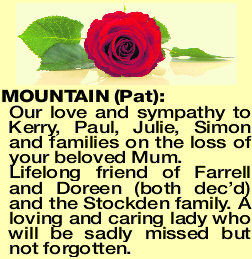 MOUNTAIN PAT Our love and sympathy to Kerry, Paul, Julie, Simon and families on the loss of your beloved Mum. Lifelong friend of Farrell and Doreen (both dec'd) and the Stockden family. 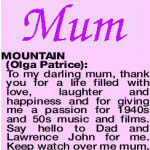 A loving and caring lady who will be sadly missed but not forgotten.